My secret life is filled with psychic vampires, wheelchair zombies, chain-rattlin’ ghosts, and a one-eyed cat. But they’re nothing compared to my real-life stalker: a sixth-grade girl named Kandi Kain. . . . Lincoln Jones is always working on the latest story he’s got going in his notebook. Those stories are his refuge. A place where the hero always prevails and the bad guy goes to jail. Real life is messy and complicated, so Lincoln sticks to fiction and keeps to himself. Which works fine until a nosy girl at his new school starts prying into his private business. She wants to know what he’s writing, where he disappears to after school, and why he never talks to anybody. . . . The Secret Life of Lincoln Jones is a terrifically funny and poignant story about a boy finding the courage to get to know the real characters all around him—and to let them know him. I have never read a book by Ms. Wendelin Van Draanen before and for me that is the best feeling. Falling into a book with no expectations feels like a kid walking into a candy store for the first time, even though opening a new book is a little like that #noregrets. The words hooked me in and my heart grew for Lincoln and the story he has to tell. All life really is another story. Everyone has one to tell and for Lincoln its about his story and the people that fill it. We see what its like to go to a new school, the bullies we can encounter and realize how hard, for Lincoln, mothers work to give best life for their kids. Of course that the one thing I for sure love is that Lincoln escapes his reality by writing fiction. But another great thing about Lincoln and everyone one felt and sounded real. i could picture everyone clearly and not only I but readers will fall in love with the characters of the story and the hope Lincoln has in the future. I LOVED the mother-son relationship in the novel. I feel that sometimes books overlook this or they are not stretched out to their full potential. And seeing this relationship makes me curious as to what other books are out there with this same sort of bond. Overall this was a fantastic story. I will be on the lookout for the authors other books. 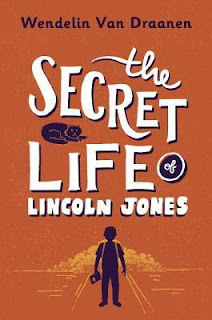 for you, reader, take a chance with Lincoln and find out the truth behind his secret.